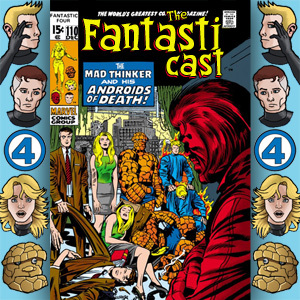 The Fantasticast Episode 110: Fantastic Four #96 – The Mad Thinker And His Androids Of Death | The Fantastic Flame On! Hello, and welcome to episode 110 of The Fantasticast. Each week, Steve Lacey and Andy Leyland guide you through every issue, guest-appearance and cameo of The Fantastic Four. This week on the show, Andy’s been hit with a terrible cold, and it sort of shows… However, this doesn’t stop him from teaming up once more with Steve and tackling the final Lee/Kirby Mad Thinker story. Can a good Mad Thinker issue be produced in the dying days of the run? And is it mere coincidence that Steve has been watching lots of Battlestar Galactica in the lead-up to recording this episode? This entry was posted on December 13, 2014 at 6:00 pm and is filed under Podcast with tags 1969, Fantastic Four, Frank Giacoia, Jack Kirby, Podcast, Sam Rosen, Stan Lee. You can follow any responses to this entry through the RSS 2.0 feed. You can leave a response, or trackback from your own site.